Foremost, I would like to thank the Special Representative of the Secretary-General for Children and Armed Conflict and the Special Representative of the Secretary-General for Violence against Children for their valuable contributions to this discussion. The ongoing imposed violence has had a devastating effect on our people, especially our children. Violent proxies from abroad have sought to sow discord within our society, inflicting severe trauma to our children. The most recent attack on an educational center in the western part of Kabul illustrates the heinous atrocities of these proxy forces. Just last year, as a result of the war, 3,179 children were killed and maimed. Safeguarding the rights of children in the midst of conflict has been a challenge. The protracted war is the biggest impediment to fully realizing these rights. Terrorists are cowardly exploiting children’s innocence by abducting and brainwashing them outside of Afghanistan to carry out suicide attacks. The Ministry of Defense developed and adopted a Child Protection Policy. Established the position of children secretariat at the Ministry of Labor and Social Affairs, which reports to the Office of the First Lady and Second Vice President. Amended trafficking in Persons Law. Developed the Child Labor Strategy and Action Plan to eliminate child labor. Amended the legislation on Civil Registry, enabling us to issue identification cards to children whose parents are unknown. My government seeks to use education as a tool to empower children. In this regard, we’ve raised the legal marriageable age to 18 years, enabling girls to further pursue their education. As a result of this legislation, we’ve witnessed a steady 10% decline in child marriage. Moreover, eleven special schools have been recently established for children with disabilities across the country. Additionally, the Ministry of Refugees and Repatriation’s efforts in the last four years enabled more than 2 million internally displaced children to return to school. Despite these achievements, we also face challenges. 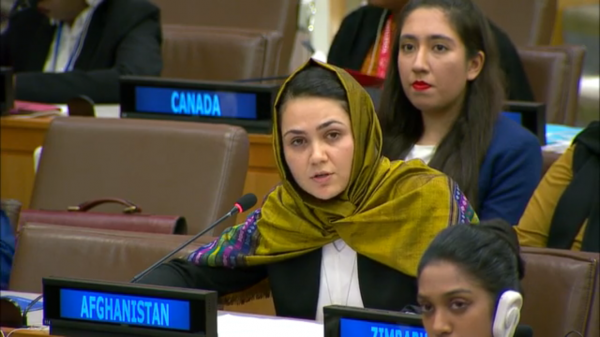 UNICEF’s recent annual report on Afghanistan indicates that gender inequality severely affects the lives of children, particularly in the education sector. According to this report, 75 percent of the 3.5 million out-of-school children in Afghanistan are girls. This disparity is often exacerbated by limited access to services in rural areas and parental reluctance to allow girls to walk long distances to school. Today, the infant mortality rate is nearly 2.2% whereas over a decade ago, it was approximately 25.7%. Similarly, nearly 40% of childbirth deliveries are now carried out by experienced health professionals whereas a decade ago, only 20% of deliveries were performed by professionals. Also, to address the issue of malnourishment, the Ministry of Public Health has recently built 924 Malnutrition Treatment Centers across the country. Thus far, one hundred sixty-two thousand children suffering from severe malnutrition have received treatment. In conjunction with these initiatives, my government is dedicated to implementing the Joint Action Plan, a comprehensive framework to safeguard the rights of Afghan children. Through this framework, we are preventing the recruitment of child soldiers and enabling delinquent juveniles to reintegrate by providing them with opportunities to constructively contribute to their society. Moreover, to preserve our recent achievements, we will continue to enforce the new penal code that criminalizes the sexual abuse of children, oversee the Juvenile Rehabilitation Centers, and increase the number of the Child Protection Units within the Afghan National Police centers. Children as young as 10 years old are marching for peace to every corner of Afghanistan, carrying Afghanistan’s unwavering spirit of achieving peace in the face of the ongoing imposed violence that is ravaging my country. These children embody our shared hope and pain. We are ever so committed to empowering them. I thank you, Madam Chair.